There's been a noticeable increase in motorized vehicles on the Strand in the past year. These range from electric bikes, motorized skateboards and even scooters. Many of these are being driven at unsafe speeds. While there is some precedent for banning these (we banned Segways a while back), I suggest increasing enforcement of the speed limit on the Strand for these types of devices so that they can be safely shared with pedestrians and other non-motorized rides. I'd like to have more parking for scooters closer to the beach. Manhattan Beach has scooter parking on Ocean behind one of the bars (possibly rock n fish?) and it does not take up much room at all. It would make my beach days a lot more enjoyable to not have to spend so much time trying to find parking. In order to determine the impact of the. number dogs on the local neighborhoods there needs to be an accurate count. The traffic coming and leaving Hermosa on Gould is becoming worse and worse as the years go by during heavy traffic times. There are 2 specific intersections which are slow, dangerous, and confusing to most drivers. The intersection of Gould and consecutively Ardmore and Valley (if going East-West): The traffic backs up for 200 yards in the evening in all directions of this intersection. It backs up almost all the way to Morningside in the mornings. Gould/27th and Manhattan Avenue: This 5 way intersection is really confusing to most drivers. It creates unnecessary honking and frustration. Both of these intersections should be considered for a revamp using a roundabout each. Roundabouts help keep the traffic flowing and work extremely well all over Europe (and they have much tighter streets than we do). The argument against a round about on Valley is the walkers/runners need to be able to cross Gould. That could be solved by putting an automated crossing light just like the ones we have on Pier Avenue which work really well. I understand that the Gould - Valley intersection was just revamped, but the work didn't sold the traffic issue. Traffic has been cited at the #1 complaint from Angelinos. Idea: Bring back the St. Pat's street fair. I understand the City compromised with the shop owners to only have street fairs twice a year. However, the St. Pat's parade was always more enjoyable and attracted more people when combined with the street fair. The City generally seems in favor of supporting ways for residents to get around town by means other than by car. Having accessible sidewalks should be a fundamental part of this effort. 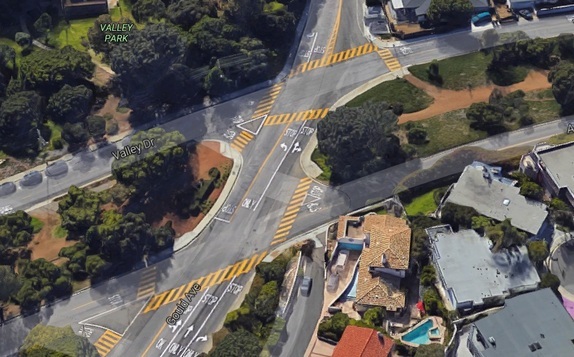 Unfortunately, being on foot of any number of streets in the city (Manhattan Ave, Monterey Blvd, and nearly any east/west street east of Valley) means snaking around obstructions and often walking into the street to avoid cars parked in driveways extending well into the sidewalk. Some cities have provided smartphone-based 311 apps to report violations and make enforcement requests. Perhaps Hermosa Beach should consider something similar. Or at the very least, have parking enforcement step up its enforcement efforts. After all, what good is a beautiful, walkable beach town if you can't actually walk it? Idea: Improve/change plants around the Hermosa Beach sign entering Hermosa on Prospect off of 190th. Many are dead and not appealing.